Missisquoi National Wildlife Refuge, established in 1943, is located on the eastern shore of Lake Champlain near the Canadian border in Franklin County, Vermont. This 6,729 acre refuge includes most of the Missisquoi River delta where it flows into Missisquoi Bay. The refuge consists of quiet waters, riverine floodplain forests, and emergent wetlands which attract large flocks of migratory birds. Upland areas of the refuge are a mix of open fields and a hardwood forest of red oak, white oak, American beech, quaking aspen, hemlock and hickories. Both of these areas provide habitat for migratory songbirds, resident mammals and other wildlife. 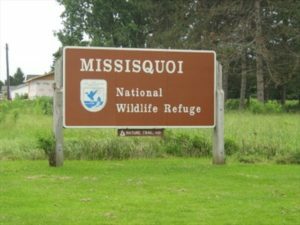 Missisquoi refuge is one link in a chain of refuges for migratory birds that extends along the Atlantic Flyway between northern breeding grounds and southern wintering areas. The refuge provides important feeding, resting and breeding habitat for migratory birds, especially waterfowl, in the northern Lake Champlain section of the flyway. Refuge lands also protect the Shad Island great blue heron rookery, the largest colony in Vermont. The refuge is open daily from dawn to dusk.